H Collective has released the first trailer for James Gunn's BrightBurn and it looks pretty crazy. 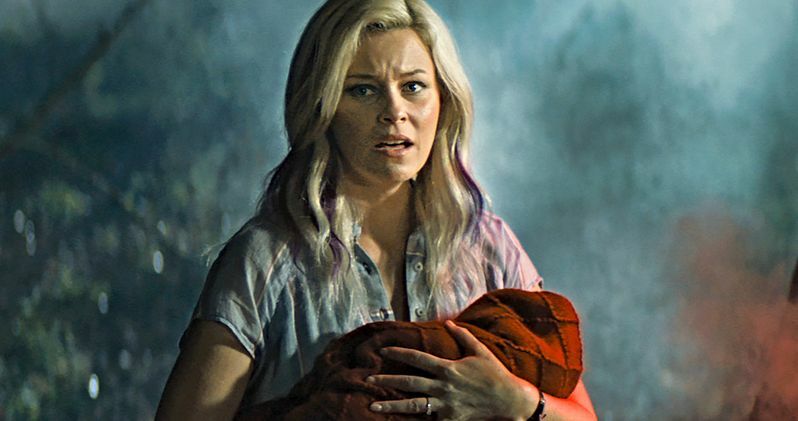 The superhero horror origin story stars Elizabeth Banks as a mother who discovers an extraterrestrial child (Jackson A. Dunn) in her yard, after praying for a baby. However, this infant isn't delivered like a normal human being. The baby crash-lands on Earth, much like another well-known superhero in the DC universe. However, things don't really go in a bright and cheery direction like some aspects of Clark Kent's origin story, and it all starts to get out of hand rather quickly. From producer and creator James Gunn, Brightburn poses a new question: What if a child from another world crash-landed on Earth, but instead of becoming a hero to mankind, he proved to be something far more sinister? Director David Yarovesky presents a startling, subversive take on a radical new genre: superhero horror, which was written by Mark Gunn and Brian Gunn. The trailer was unleashed today at Brazil Comic-Con to an enthusiastic audience. H Collective CEO Nic Crawley revealed that the trailer was released to celebrate the one-year anniversary of the Collective. The Brightburn trailer starts off pretty innocent, but by the end, there is truly something sinister going down. As the alien baby grows up, he realizes he is not like other kids and is strangely drawn to the spacecraft that he was brought to Earth in. As the trailer progresses, the boy starts to draw a specific design wherever he can and later gains a cape and some glowing red eyes. Though the trailer takes place in Kansas, it doesn't take long before the backdrop is completely transformed into something that looks like Superman meets Salem's Lot. In addition to the traditional scares, watching the kid chew on a fork is definitely one of the more disturbing aspects of this so-called superhero horror project. In addition to Elizabeth Banks (The Hunger Games), Brightburn also stars David Denman (13 Hours), Jackson A. Dunn (Shameless), Matt Jones (Home), and Meredith Hagner (Younger). Guardians of the Galaxy director James Gunn is on board as producer, with executive producers Mark Gunn, Brian Gunn, Dan Clifton, Simon Hatt, and Nic Crawley. The H Collective fully financed the feature and produced alongside Gunn's company, Troll Court Entertainment. Screen Gems will release the film wide theatrically in the U.S over Memorial Day Weekend, on May 24th, 2019. The imagery of Superman is all over the Brightburn trailer, which adds another eerie aspect to the horror movie. James Gunn originally wanted to premiere the trailer at San Diego Comic-Con, but that was around the time that he was fired from Guardians of the Galaxy 3, which is currently still looking for a director. Gunn wanted Brightburn to premiere in front of the superhero-loving audience, and Brazil Comic-Con was the perfect place. You can watch the trailer for yourself below, thanks to the Sony Pictures Entertainment YouTube channel.